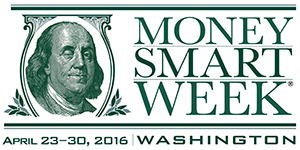 Governor Jay Inslee has proclaimed (pdf) the week of April 23-30 as Washington Money Smart Week. Money Smart Week® is a public awareness campaign designed to help consumers better manage their personal finances. This is achieved through the collaboration and coordinated effort of organizations including businesses, financial institutions, schools, libraries, not-for-profits, government agencies and the media. These groups come together once a year to stress the importance of financial literacy, inform consumers about where they can get help and provide free educational seminars and activities throughout the week. Title: Budget For Your Bank!